You have guest coming for lunch , but may be they are coming in late morning !! It’s neither the time , you can offer breakast nor you can offer lunch . For me , in this type of cases stuffed pull apart bun with tea is always the best choice , to be served some times before the lunch . 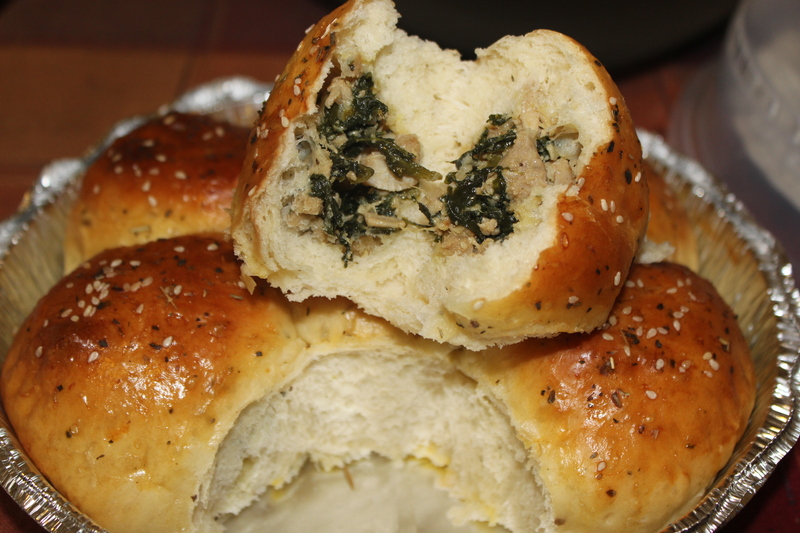 The soft buns with savory filling inside is really something that always comes up as extra ordinary !! 1. Marinate the chicken with soy sauce and ginger paste . Heat oil and add the chicken . Fry well , when the color is changed agg the spinach . The spinach will release water . dry out the water . Turn off the stove . add the chopped onion , green chilies and cheese . Mix well and keep aside . Stuffing is ready . Remember the filling or stuffing should be cooled down before you put them inside the bun . 2. Mix all the ingredients for bun except oil . Be careful while adding luke warm milk and water . If you use too hot water the yeast might get killed , and if you use room temperature or cold water, the yeast won’t wake up !!!!!! In both case the dough will not rise and everything will go in vain . So always use luke warm water in any recipe where you have yeast as an ingredient. Make a soft dough . If you make the dough hard , the bun will be hard , so make it a soft dough . 3. Knead well . The dough will be very sticky . Now add the oil and form the dough into a round ball . Now it’s easier to work with the dough. Knead very well . The more you knead, the softer bun you get . Knead at least 8-10 minutes .Put the dough into a closed lid box and place it in a warm place . It may take an hour or more to get the dough double in volume . If it becomes fluffy and double in volume , the dough is ready to make the bun. Sometimes it may get longer time to rise . Sometimes it takes almost 2 and half hour to rise up and to be fluffy . So don’t do anything until it rise up in volume and becomes fluffy . 4. Punch down all the air form the dough . Now Make balls from the dough . Flatten the ball and put some filling into it. Reshape the ball . Make all the buns like this . All of them should be of same size . 5 .Grease a springform or any other pan . Line with parchment paper .I used the one time use aluminium pan .Place the balls closely to each other but not touching each other. Do keep some space . Dont place them so close as they touch each other because after second rising they will rise and spread , that time they will touch each other , and that is desired . But if you place them touching each other , the shape will not be good . Cover with a wet cloth for 20/ 30 minutes and let it rise again a bit . At that time you will see the balls are touching each other by rising and spreading . Perfect !!! In the mean time pre-heat your oven to 400 FH or 200 Centigrade. 5. Brush with egg and sprinkle some sesame/nigella seed and Italian seasoning. Bake for not more than 20 minutes at 400 FH in a pre heated oven . If you bake for longer , the buns will be hard . 6. After taking out from oven rub some butter on it for a smooth and glossy finishing . That looks delicious. Chicken and spinach makes a great combo! Thanks a lot Anjana !! Looks yummy, BUT when and how much stuffing to add to the dough? ?